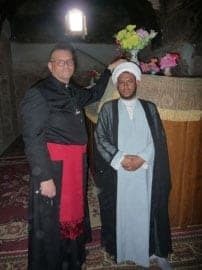 As well as speaking out for persecuted Christians, Canon Andrew White has become the de facto ‘protector’ of the six Jews still left in Iraq, whose lives he believes are at risk, and the guardian of Iraq’s 2,600-year-old Jewish heritage. Canon White will address the challenges of working for peace in a war zone, and give us his views on the future of Iraq and its beleaguered minorities. “I have been detained at gun-point, been thrown into a room with people’s chopped-off fingers and toes all over the floor and have had my picture posted on walls around Baghdad, saying,”Wanted, Dead or Alive,” says Canon White. Regardless of the dangers, Canon White works from St George’s Anglican Church in Baghdad to bring humanitarian aid to some 150 Iraqis of all faiths every day. Canon White studied at St Thomas’s Hospital, the Hebrew University in Jerusalem and at Cambridge. He has been awarded over 15 Peace Prizes .and has written several books. The Sephardi Centre, 2, Ashworth Road, London W9 1JY (nearest tube Maida Vale).